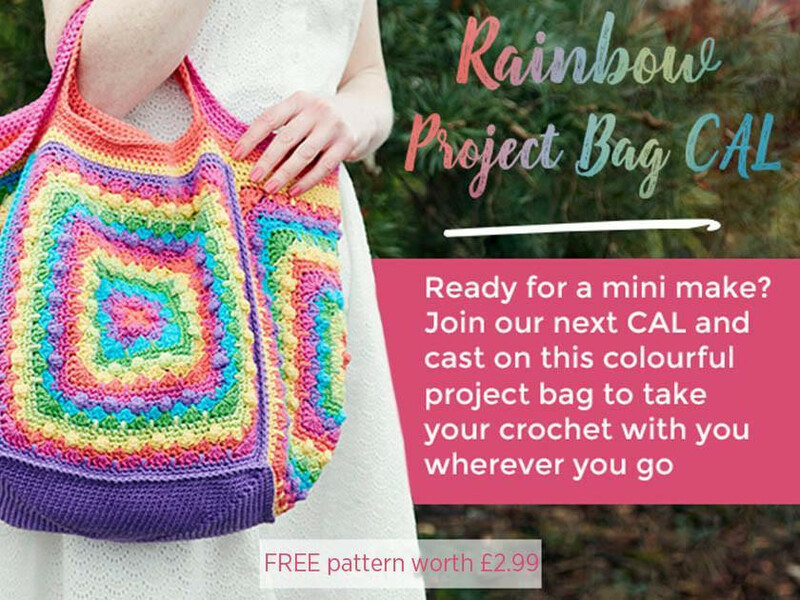 Rainbow Project Bag CAL - join in here! Join in with this mini crochet a long! Don't panic if you're new to crochet, as we teach you how to crochet this flower from start to finish in our very floral pictorial guide, below. Worked in rounds of Stylecraft Classique Cotton in sherbet shades, who could ask for a sweeter project? All you'll need to get going on your bag of many colours is a 4mm crochet hook. Give yourself a technicolour treat with a Clover Amour Easy Grip Crochet Hook – they're soft to the touch and easy on your hands. An open-topped cube when finished, each square measures 26cm square for a generous space to store a whole lot of yarn. There's room to store a few printed patterns from The Knitting Network in the side too. Make your tote last a lifetime with the addition of a pretty fabric lining. A metre or so of plain cotton in a vibrant complementary shade stitched inside will help the finished item hold its shape if it's overloaded with heavy balls. Lining a crochet bag is easy. Simply cut the lining slightly larger than your finished pieces when stitched together to leave plenty left for a seam. Iron a short hem down (a couple of centimetres is plenty) and over sew in short stitches all around the inside edge. Go all out and grab yourself a magnetic bag clip fastener to keep the top closed when you're on the go. They're so easy to put in, all you need is a few simple stitches. Just follow the instructions on the packaging. Chains (ch): This simple stitch is all you need to get started. Chains can also jump across gaps or create spaces. Double crochet (dc): Short but sweet, these fiddly stitches are dense. They're small but perfectly formed. Slip stitch (slst): Used for joining, finishing off rounds and skipping across fabric where you don't want to add any extra depth. Treble clusters (trcl): For adding texture, these are multiple part-worked trebles joined together to make clustered stitches. Anyone keen to join in who also took part in our Flower Garden CAL may find these stitches familiar but if you get stuck, check our illustrated guides for full how-to instructions. Don't forget to visit our Facebook page where you can share your progress pictures and join the Rainbow Project Bag CAL conversation.